Driving directions to MY STORAGE Self Storage at Jungceylon Shopping Center, Patong, Phuket, Thailand. 1. Turn right toward Surin, Kamala, and Patong at the Cherngtalay traffic light. 2 Drive pass Surin, Kamala and when in Patong stay on the main road leading towards Phuket town until you reach the first traffic light (0.8 km). 3. Turn right at the traffic light direction south Patong and drive until you have Jungceylon Shopping Center on your right (1.7 km). 4. Turn right by B Quick at Jungceylon Shopping Center and drive until you reach the roundabout (0.2 km). MY STORAGE Self Storage facility will be clearly visible on your left hand side. 1. Drive in direction Patong pass Kathu and over the hill leading to Patong. 2. When in Patong stay on the main road towards the beach until you reach the first traffic light (1 km). 3. Turn left at the traffic light direction south Patong and drive until you have Jungceylon Shopping Center on your right (1.7 km). 4. Turn right by B Quick at Jungceylon Shopping Center and drive until you reach reach the roundabout (0.2 km). 1. Drive north along the west coast towards Patong. 2. When in Patong stay on the main road until you reach the first major 4 way crossing at the south end of town. 3. 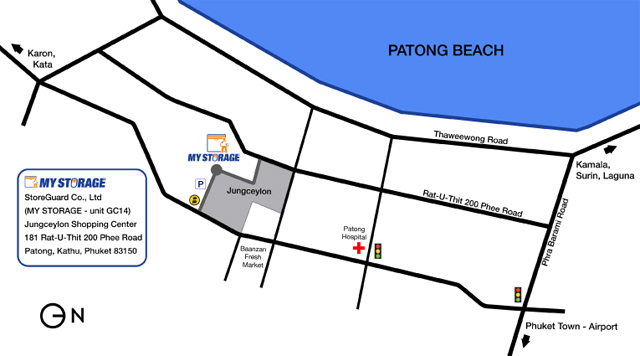 Drive straight through crossing direction north Patong until you reach Jungceylon Shopping Center on your left (1.2 km). 4. Turn left by B Quick at Jungceylon Shopping Center and drive until you reach the roundabout (0.2 km).